A school can change students, but it’s even more amazing when students change a school. 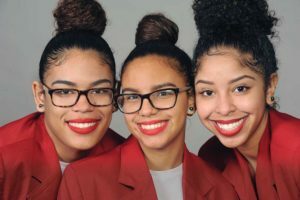 When a trio at Providence (R.I.) Career and Technical Academy put their heads together to improve their campus, the results were as big as their cool hairdos. Laisa Baez, Aliesha Duran and Ysmel Martinez entered SkillsUSA’s Community Service contest with “The Four Cs of Cosmetology: Creating a Colorful Community with Cosmetology.” The project was designed to improve attendance and make school fun and engaging. When the team started, 46 percent of the school’s students had chronic absences. In response, the trio created new work-based learning experiences. On Salon Service Saturdays, they collected bundles of hair to donate to Wigs for Kids and Children with Hair Loss. They collected winter coats to donate at Thanksgiving. They sold candy on Fridays and made a donation to the Ronald McDonald House to support a family’s stay. They collected prom dresses for needy students and held fundraisers. Cosmetology instructors Rahsaan Gomes-McCreary and Diana Furtado offered support every step of the way. The activities meant students spent more time on campus and enjoyed it more — including after school and Saturdays. By year’s end, absenteeism was down 9.8 percent. Also, in SkillsUSA’s Models of Excellence program, the students’ chapter earned a Silver Chapter of Distinction award. Fifty student members earned the President’s Volunteer Service Award by putting in 636 total hours. To inspire others, the students even raised money for a plaque of Christiana C. Bannister, an entrepreneur, wig maker, hairdresser and abolitionist born in the 1800s to African-American and Narragansett Indian parents.